January 1, 2016 – When reflecting on all the blessings God has bestowed upon us this year once again we were back on the road traveling. During this year’s travels we explored all of the western states from the top to the bottom of our country. Here’s a map showing where we traveled this year. Almost 8,000 miles of travel!! The western states of America are huge states, so traveling through them took quite a while. There are huge deserts, almost no grass, beautiful mountains and canyons, cactus, caves, volcanoes, tumble weeds, dust storms, very low humidity, and so much more there that this old Louisiana couple were blessed to experience. There were fun days, learning days, oohs and aahs days. Each new day brought with it a breathtaking adventure and we loved every minute of it. We always TRY to rest in between adventures. Sometimes that doesn’t work out and we are on the go everyday. We appreciate our down time when those resting days happen. From the slab, to the framing, adding plumbing and electricity, then sheet rocking, roofing and siding, painting, wood trimming, appliances, bathroom and kitchen equipment, counter tops, cabinets and doors finished up the house. Roy built our storage building and the water well shed to match the house. Pine trees were pruned and thinned out and seemingly tons of dirt were brought in and pushed around all over the property. A gushing waterway was harnessed and a nice grassy area created in the back by the pond. On the RV side there was a patio poured, gravel pad created for Dora and full hook ups installed! Landscaping for the house and our RV space wrapped it all up. What a wild and wonderful experience that time was. Madisyn’s 6th birthday, Easter with the family, Madisyn’s kindergarten graduation all took place while we were home in Amite and we loved being at each one! We got to spend lots of special time with Madisyn fishing in our pond, rolling down our hill and planting flowers and plants. In addition to getting to visit with many friends and family while we were home we ended our time home at our church’s annual picnic at Camp Living Waters where we ate, swam, slid down the large slide and visited! We found wonderful folks to rent our house to and we started making traveling plans. In early May we set out to live on the road again. This year’s journey took us through every state out west. Our route took us through: Louisiana, Arkansas, Kansas, Oklahoma, Kansas, Colorado, Montana, Wyoming, Idaho, Washington, Oregon, California, Nevada, Utah, Arizona, New Mexico, Texas and back to Louisiana. Month by month here’s where we traveled to and what we saw! A link to that month’s main page in the blog is provided next to each month. If something catches your interest and you want to see more about it you can click on that and go there! While staying at Angler’s Holiday Mountain Resort in Mountain View, Arkansas the river waters rose to overflowing. While staying at Terra Starr Park in Checotah, OK( near Tulsa, OK) we traveled to Broken Arrow, Oklahoma to see Matt and Alanna Traylor and their girls! We visited with them and went to church with them. Myriad Gardens OK City–One of Oklahoma City’s public spaces, offering its visitors a 15 acre natural escape in the very heart of the metro known as downtown Oklahoma City. While staying at the Shawnee Exposition Center in Shawnee, OK we visited with Susan Randels, my childhood pastor’s daughter, who was my dear friend throughout my childhood and my youth! Wichita River Fest a big festival around parts of downtown Wichita. We got free bottles of Sweet Baby Rays there! Shady Grove RV Campground in Seibert, Colorado – our least liked park and city. No internet, nothing at all to do and nothing within many miles of us! When you’ve just arrived in Colorado that’s not the place to be stuck at! Pikes Peak by car – Boots! Diamond Campground in Woodland Park, Colorado was our favorite park along our travels. The park itself was nice but what made it for us was the friendly seasonal folks who lived there from May to October every year. We may like to do that in the future! Castle Museum and Carriage House, known by locals as ‘The Castle’. We did not see a Walmart, Walgreens, CVS, KMart, Wendy’s, McDonald’s, Burger King or other big chain stores in over a month. Fern Canyon, an unforgettable natural wonder that Steven Spielberg chose as a location for Jurassic Park 2: The Lost World. I think you can see that September was our busiest month! Arizona City, Arizona – Met Curtis Coleman, Founder and Owner of RVillage which I work for. We stayed at Curtis’ home playing grandparents to his doggie Augie while he was out of town. Bishop’s Landing RV Resort in Willis, TX – love this town. If I ever had to live permanently elsewhere I believe this little town would be near the top of my list! Chauvin’s RV Resort in Amite, LA – yes that’s us and that’s our home for the holidays! While home for the holidays we were extremely blessed to be allowed into the lives of Chip’s fiance Misty and her daughter Kallie. Chip proposed to Misty soon after we returned and we’ve been able to spend time getting to know them and learning to love them. Kallie is a super cool teenager with beauty inside and out! We spent time with all of them over the holidays fishing, playing and visiting. Thanksgiving was spent with my sister’s family! We got to enjoy so many of the Christmas activities at our church. Our new Pastor and Minister of Music are wonderful gifts from God. We attended Christmas Eve Candelight Worship Service there with Chip’s family and it was perfect! Being in God’s house with family is as good as it gets! Our family visit to Celebration in the Oaks at City Park in New Orleans was a highlight of our time at home. Gasoline and Diesel prices fell throughout the year. This is what it is now in Louisiana! 2016 will find the Chauvins headed to Tennessee for Roy to have full knee replacement surgery. Exploring various parts of the East going all the way up to Canada and all along the east coast is our travel plan for 2016 and 2017. Shorter trips than before, with a month or so at home in between, is the only change. As you can see above we saw so much this year it was way overwhelming. We’d like to not be overwhelmed and get to enjoy each stop more. We are still committed to living in our RV since we love it! We hope to bring our granddaughters along with us on some of our summer travels. My work with RVillage increased a lot this year so we are better financially situated to continue seeing this beautiful country of ours! That’s it! God Bless all of You and I hope your 2016 is as super dooper as we hope ours will be! Links to our Reflections on God’s blessings for 2018, 2017, 2016, 2014, 2013, and 2012 are below. Happy New Year everyone from Roy and Rosalyn Chauvin! We are looking forward to all that God has in store for us in 2016! Mr. Bingle as we saw him in Celebration in the Oaks. Monday, December 21, 2015 – For those of us who grew up in New Orleans and are now in our 50s, 60s and 70s, Mr. Bingle was a large part of our New Orleans Christmas. This amazing little guy is making a comeback and today’s children are learning about him and he is entering their life this Christmas. When we visited Celebration in the Oaks an oversized version of this little guy was on display! That one is probably not as large as the version that hung from Maison Blanche (an upscale department store from that era). Here’s a bit about how Mr. Bingle came to be and some pictures from old times and present times. Since 1948, a little white snow fairy named Mr. Bingle has been a magical part of the Holiday Season for children and adults in New Orleans and throughout the South. Created by Mr. Emile Alline, a window decorator at the former Maison Blanche Department Store on Canal Street in New Orleans, Mr. Bingle came to life as a miniature snowman with an upside-down ice cream cone for a hat, holly-leaf wings on his back, a red ribbon and bells around his neck, red-striped mittens on his little hands, cherries for eyes and a licorice smile. Mr. Alline also dreamed of presenting elaborate puppet shows with the doll, and for the task, he recruited Mr. Edwin H. “Oscar” Isentrout, an eccentric puppeteer who had been performing with his puppets at (of all places) a Bourbon Street burlesque club. With Isentrout providing movement and a squeaky voice for the character, legend has it that Mr. Bingle truly came to life, if only in the imaginations of the thousands of children who adored him. As the Maison Blanche chain spread, so, too, did Mr. Bingle’s popularity, at one time reaching as far as Tennessee and Florida. Mr. Bingle has even made an appearance at the White House as well as at the 1989 Citrus Bowl in Florida. Aside from the popular stuffed dolls, Mr. Bingle’s image could be found on everything from Christmas ornaments to coffee cups to clothing. The Dillard’s Department Store chain bought Maison Blanche in 1998 and closed the Canal Street store shortly thereafter, but Mr. Bingle still lives on at the Dillard’s in Lakeside Shopping Center. Although his reach is limited to the Greater New Orleans area, he still makes the rounds to Dillard’s stores on the Westbank and across Lake Pontchartrain in Slidell and Covington. Mr. Bingle’s creators, however, are no longer with us. Oscar Isentrout passed away in 1985 at the age of 61, and Emile Alline left us in 1998 at the age of 81. But these men, together, have left a gift that will endure forever in the hearts of all the children who have come to know Mr. Bingle. The first photos below are from many years ago when only black and white photos were available. This is the Mr. Bingle era I remember as a child. The color photos are from later years and current years. Mr. Bingle made us smile and put joy in our hearts. With us at Maison Blanche all year. I hope I’ve accomplished what I set out to do, introduce you to Mr. Bingle! He did add an amazing element to the wonderland of Christmas in New Orleans. He didn’t however ever take the place of Jesus’ birth in our hearts. I hope, as you and your family approach the day we celebrate his birth, that you will once again turn your focus to the true meaning of CHRISTmas! We worshiped with our church family yesterday morning at Trinity Baptist Church and will do so once again on Christmas Eve. George Martin sang “Mary Did You Know” which spoke directly to my heart. Our Christmas Eve worship service is at 6:00 pm. The church’s address is 42062 Pumpkin Center Road, Hammond. About a mile off of I-12 on the Pumpkin Center/Baptist exit. Even though we are Baptist you actually go in the Pumpkin Center Road direction. If you and your family do not have anywhere to worship on Christmas Eve I invite you to worship with us! What a perfect way to focus on the true meaning! Family, friends, everyone is welcome! Saturday, January 2, 2016 – I came across the information below recently. It perfectly depicts why Roy and I always put on weight when we are home. It also fits into the blog posts I’ve been writing about things I love in New Orleans. Folks around this country do not know what they are missing! Even though I did not write this blog, I changed photos to ones I liked better and added and changed information I wanted you to know. I invite all of you to come down south and partake of all these wonderfully delicious dishes that are so very Louisiana! There were originally 28 things on the list by Markita Lewis, but I removed the ones I don’t care passionately about so Rosalyn’s list is only 17 things! I guarantee this blog post will leave you quite hungry and possibly even planning a trip to Southern Louisiana to check it all out!! You thought that leaving Louisiana would be a good idea to avoid the humidity and the heat and to see what else is going in the world. Within a week of moving to a different state, however, you realized that you might starve to death. There are only a few (if any) restaurants that serve the types of foods you’ve eaten your entire life. You can’t make groceries (yes, make groceries) because the shelves of the grocery store are missing items that are essential to your pantry. And no one knows what a roux is! It’s a bigger culture shock than what you were expecting. I moved from the Jambalaya Capital of the World to Georgia a year and a half ago, and I still can’t get over how different things are over here, even in a relatively close southern state. I am fortunate enough to have found some other Louisiana natives in the Peach State and though we do cook up some good food, we also talk at length about the foods we wish we had from back home. While we’re all patiently awaiting the next time we can visit the Boot State and gain approximately 10 pounds, let’s appreciate the unique culture of Louisiana and all of the food that we took for granted. Gumbo is the best soup ever invented, and it’s so good that it was made the official state cuisine of Louisiana in 2004. Finding good gumbo made by a non-native in a different state is extremely difficult, and we often leave disappointed after tasting someone else’s attempt. Time to start working on that gumbo recipe, y’all. 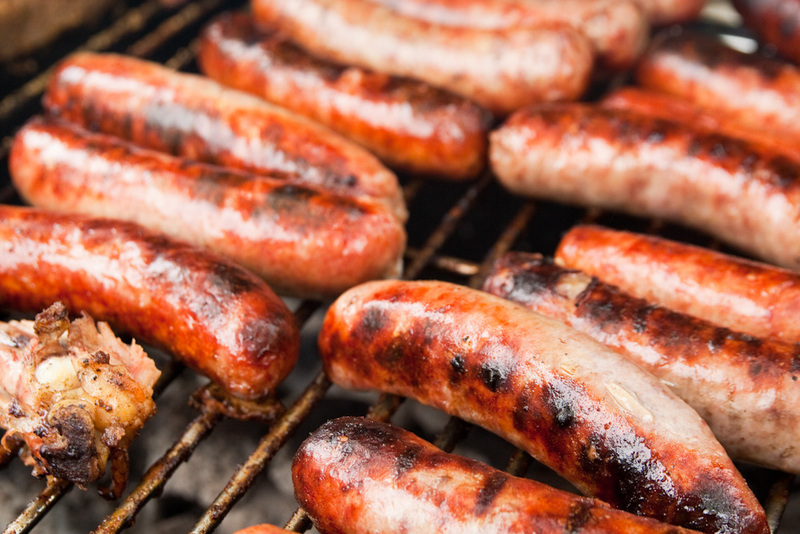 Every Louisianan knows that not all sausage is created equal. We are very particular about the types of sausage we use because the sausage makes the dish. When we can’t find good Andouille or hot sausage, it’s not uncommon for us to lament at length about our lack of good sausage options. It’s probably one of the only dishes that you’ll see commonly made in a giant cast iron pot reminiscent of a witch’s cauldron. And if you could, you would buy a jambalaya plate from somebody’s fundraiser right now. 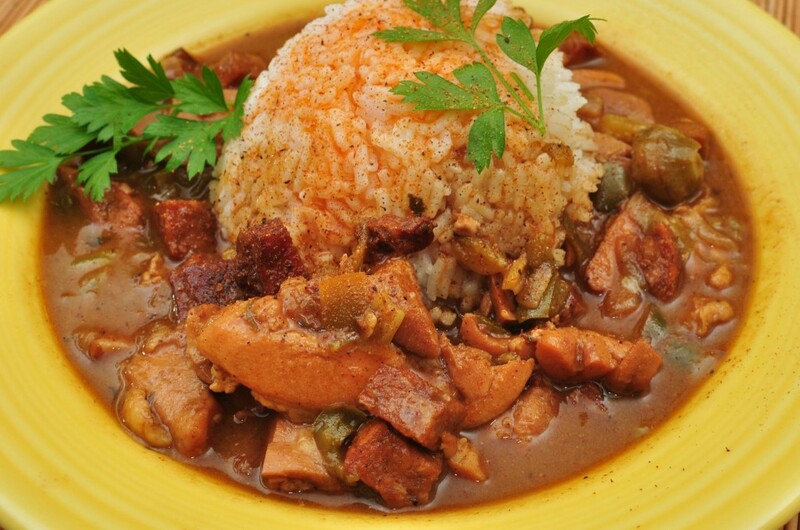 Translated into English, this dish’s name literally means “smothered.” It is best described as a stew containing seafood (commonly shrimp or crawfish) and smothered with “the holy trinity” ( onions, bell pepper, and celery) in a roux served over rice. Eating this dish is an experience. Originally coming from the name “poor boys,” this is a simple, yet tasty sandwich on toasted French bread. You can order it fully dressed (with lettuce, tomato, pickles, and condiments), or keep it simple with your meat of choice and some Tabasco hot sauce. My personal favorite is a fried shrimp po’boy. Sloppy roast beef po’boys are my second favorite! This Italian sandwich from New Orleans is bigger than your head and is made with layers of deli-style meats and cheeses and a special olive salad. We might not be able to agree on how to spell or pronounce it, but we can agree that it’s an amazing sandwich. A warm, fried, melt-in-your-mouth French doughnut with ample amounts of powdered sugar on top. What’s not to love? And although millions of tourists flock to Café du Monde or Morning Call very year for their famed beignets, Louisiana natives know the local cafes that deliver the same taste (with a much shorter line). Everyone is always happy to see king cake because the appearance of king cake marks the beginning of Mardi Gras season. Alternatively, not seeing king cake is a bitter reminder that most other states don’t celebrate Mardi Gras, and yes, you do have to go to work or school on that Tuesday. 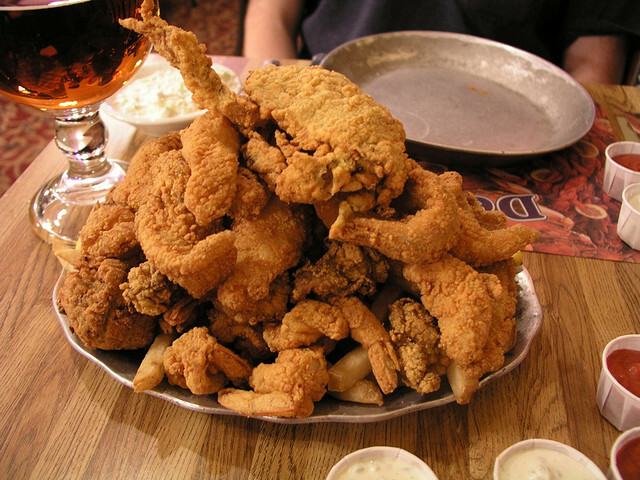 The seafood platters at our Louisiana restaurants put places like Joe’s Crab Shack and Red Lobster to shame. Nothing beats going to a restaurant and receiving a plate of well-seasoned fried and/or boiled catfish, shrimp, crawfish, crab, and frog legs (on occasion). Even the sides are great accompaniments, with restaurants offering hushpuppies, boiled potatoes or corn, or Cajun fries (Olive Garden can keep its breadsticks). A dessert made with bananas, rum, and ice cream? Sign me up! Paul Blangé had the right idea when he created this dish at Brennan’s restaurant in 1951. King Crawfish. Known as crayfish, crawdads, or mudbugs, crawfish is a versatile crustacean that can go into any dish. You can put it in etouffeé, creole, gumbo, mac and cheese, potatoes, fish, crab cakes — the sky’s the limit. It baffles us that people in other parts of the world find it a nuisance or use it as bait, and it saddens us that we can’t find any during crawfish season. Too late. Imagine boiled and seasoned crawfish, crabs, shrimp, sausage, corn, and potatoes that you can eat until your stomach hurts. Beautiful, isn’t it? It’s common to have a seafood boil during spring or summer events like graduation, family gatherings, and national holidays. You know you’re going to have a good time when someone busts out old newspapers, cardboard boxes, and a roll of industrial paper towels. This dish involves cooked shrimp, the holy trinity, and a spiced tomato sauce over rice. It’s got a nice tangy flavor, and it’s light enough that you can go back for seconds. And trust me, you’ll want to. 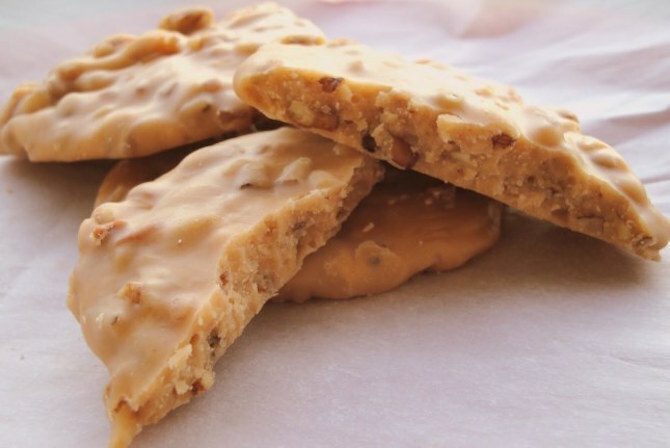 Pralines are a decadent candy made up of mostly caramelized sugar and pecans. Pralines seem deceptively easy to make, but one false move turns everything into sugar, effectively ruining your candy. In a place where it often gets to 100% humidity and temperatures in the lower 100s during the summer, we need something to stay cool. Snowballs are a perfect blend of shaved ice, syrup, and interesting additions (including candy and condensed milk), and many Louisiana natives know exactly where to go to get their fix. The snowballs in Louisiana have creative names and flavors, and the shaved ice that is used is much finer than other parts of the country. It just doesn’t feel like summer without one. We eat beans and rice on Monday, or really any day! Before washing machines, women in New Orleans would do laundry by hand — using a crank and wringer, sometimes boiling the clothes. And on laundry day, they needed to prepare a dinner that didn’t need a lot of TLC. Thus the tradition of making red beans on washday, Monday. New Orleans red beans always includes plenty of sausage (or andouille) and/or pickled pork. That wraps up all the yummy foods we miss most when not in Louisiana. I still cook some of this while we’re on the road and I always make sure I’m stocked up on the ingredients I need to make those food taste like Louisiana cook made them!! One last thing that isn’t a food, but involves food, are our food festivals. Louisiana has numerous festivals dedicated to food including the Strawberry Festival, Oyster Festival, Catfish Festival, Jambalaya Festival, Crawfish Festival and many more! Tuesday, December 15, 2015 – Our last two weekends have both included attending our church, Trinity Baptist Church, Adult and Children’s Choirs Christmas music. The Children’s music was “A Tree Lot Christmas” and was so wonderful. Every year the children 6th grade and under put on a Biblical Christmas musical and play. This one was every bit as special as all the rest we’ve enjoyed. Since I don’t teach Sunday School any longer and we are not living in town any longer, it’s a wonderful way to enjoy seeing the children grow each year. A couple of the young people you’ll see in the photos are teenagers, graduating from high school now. They were children in my 3rd and 4th grade Sunday School class and I have wonderful memories with both of them! After the Children’s Musical we all enjoyed tasting the yummy cakes baked by the men of our church. They had to bake them without help from their wives, mothers or anyone. And they did a fabulous job! I had a taste of six different cakes and they were all delicious! This past Sunday morning during our normal Worship Service time we were blessed by the musical notes played by strings and sung by our adult choir. Three Southeastern music majors accompanied the choir on their stringed instruments. Scriptures were read by church members and the choir, filling almost every seat in the choir loft, sang beautifully the Carols we love so well. Here are some photos taken Sunday morning of the Adult choir’s performance. Sunday mornings begins with Bible Study at 9:30 and Worship Service at 10:45. The address is 42062 Pumpkin Center Road. Off I-12 outside of Hammond, LA. We have wonderfully active programs for children and youth on Sunday morning, Sunday evening and Wednesday evening. Youth and Children have activities on other dates each month or so. What better way to raise your children than around other children who are learning to love the Lord and learning about Him throughout their young lives. The youth group allows us to continue teaching them about Christ as their lives become more independent of their parents. That is such an important stage in a young person’s life and Trinity’s Youth program is the perfect supplement to a parent’s Christian upbringing of their youth. I have more to share about Christmas in New Orleans and our various traditions. Thursday, December 20, 2015 – After enjoying Cafe au Lait and Beignets with the powdered sugar covering everything around us and the girls enjoying playing at one of the playgrounds, we strolled the area and saw many cool sites! The younger girls had their faces painted. Madisyn got a peace symbol painted on her cheek and Haylee got her nose and face painted like Rudolph! All the girls crawled up on the Christmas Alligator Santa which is dear to the heart of every Southern Louisianian. We even ran across some Star War warriors who posed with Madisyn and Haylee! When we made our way inside Celebration in the Oaks we found out there was more to see than we could have imagined. Lots of local vendors are featured throughout the Celebration. One was he makers of the soaps shown below. The ladies running Earth Lotions handmake their soaps and can be contacted at: Imamena5@yahoo.com. They offer way more than I photographed! Inside the big white tent near the entrance to Celebration in the Oats were children’s choirs taking turns singing precious Christmas songs and putting big smiles on everyone’s face! A Holiday miniature train was featured in one part of the park. Then there was Mr. Bingle, the long time New Orleans tradition. Mr. Bingle will get his own post but here’s the very large version of Mr. Bingle we enjoyed at the Celeration! The line for the train ride was 45 minutes long (which is mostly why I recommend not going on a Saturday night) but the ride itself was very nice. It took us all throughout the park and we got to see a lot more than we could have walked to see. The Carousel in City Park is an antique wooden carousel. The Carousel is often called the ‘Flying Horses’ by New Orleans locals. For more than 100 years, visitors have enjoyed this unique marvel – a beauty featuring “flying horses” and one of only 100 such carousels in the country. The Carousel is the masterwork of famed carvers Loof and Carmel, and has drawn praise from the National Historic Preservation Society. The Carousel is also listed on the National Register of Historic Places. Madisyn and Paw Paw enjoyed some fun time on the Carousel, same one I rode as a child! The older girls road rides Madisyn couldn’t so we’re glad she really enjoyed the Carousel! These photos are some of ours and since most of mine didn’t come out too well I grabbed some from the internet to share some of the sites at Celebration in the Oaks! Roy, Chip, Misty, Madisyn, Kallie, Haylee, Pam and I enjoyed our time seeing all the beauty, riding rides , riding the train, listening to the children sing and just being together! It was a very long day but all in all it was totally great! Mr. Bingle – more on Mr. Bingle in a future post! I’ll be sharing more about New Orleans and Christmas in future blog posts! I haven’t shared nearly enough about the wonderous things to see and do here in this city of my birth! RVers are so welcomed here and I hope this blog will give ya’ll a better inside into what to see and do in this area. This past weekend was all about Christmas, with family and our church family. city park we’ve ever seen. Here’s just a bit about City Park. It should be high on the list of “must see” places in New Orleans for all RVers and anyone who travels. It is a 1,300 acre public park, the 6th-largest and 7th-most-visited urban public park in the United States. City Park is approximately 50% larger than Central Park in New York City. City Park is very unusual in that it is a largely self-supporting public park, with most of its annual budget derived from self-generated revenue through user fees and donations. Enormous damage was done to the park by Hurricane Katrina and has taken years to recover. City Park holds the world’s largest collection of mature live oak trees, some older than 600 years in age. The park was founded in 1854, making it one of the oldest parks in the country, and established as the “City Park” in 1891. City Park is a large part of my growing up years and I plan to write a blog soon sharing more about why everyone should visit here. For today I’m going to share our family outing to City Park and the annual Celebration in the Oaks there. New Orleans’ mild winter weather and City Park’s stunning natural landscape, with its oak groves, moss-covered cypresses and meandering lagoons, make Celebration in the Oaks a truly unique holiday event. This beloved annual celebration is fun for all ages and has become an enduring holiday tradition for families, who come to Celebration in the Oaks to ride the train or carousel every year. Visitors are treated to a wide range of attractions, from light displays to the walkways lined with dozens of Christmas trees decorated by local school groups. Perennial favorites include the two-mile train ride through glittering light exhibits, the animated Cajun night before Christmas display, and of course, New Orleans’ iconic snowman Mr. Bingle – a holiday character beloved by generations of New Orleanians. Mr. Bingle will also get his own blog post soon! Roy and I visited City Park Saturday with Chip, Madisyn, Misty, Kallie, Haylee and Pam! Even though I was born and raised in New Orleans we’ve never been to Celebration in the Oaks but it will hopefully become an annual family tradition! The colliseum where I roller skated! We started the day by walking through a bit of the park along the ponds feeding ducks, enjoying the beauty of the park and sitting atop one of the City Park Lions (cement lion the girls are waving from). When I was a child my father brought me to City Park to the colliseum attached to the lions where I could roller skate on the large cement floor there. This was followed by enjoying coffee/milk and beignets. Whats a beignet?? Beignets are commonly known in New Orleans as a breakfast served with powdered sugar on top (actually LOADED with powdered sugar on top). They are traditionally prepared right before consumption to be eaten fresh and hot. 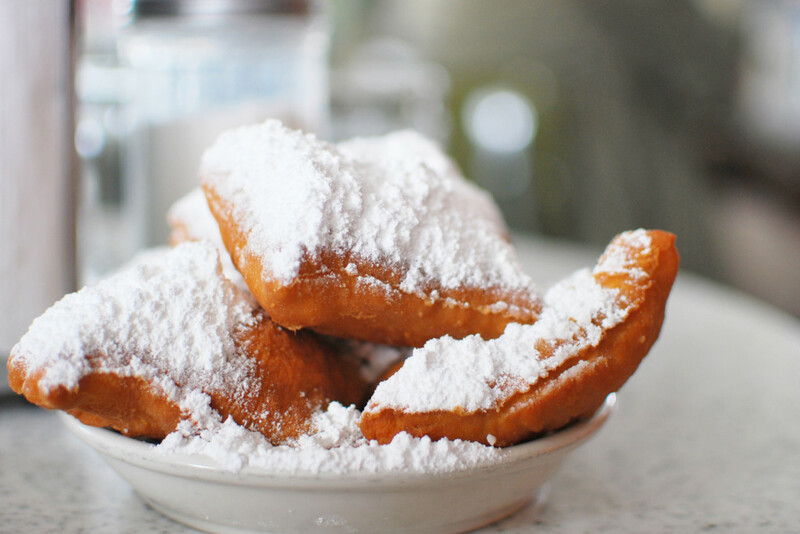 Beignets just scream New Orleans Cuisine and should always be enjoyed by everyone visiting the area. We enjoyed our beignets and Cafe au Lait at “Morning Call” Coffee Stand located within City Park. Their sister coffee stand is known as Cafe du Monde, both of which now have multiple locations throughout the New Orleans metropolitan area. The original is down in the French Quarter and most every youngun growing up in New Orleans remembers early morning, mid day or late night visits there with their parents. Beignets are typically served with either Cafe au Lait (coffee with cream) or milk. My favorite growing up was beignets with chocolate milk. 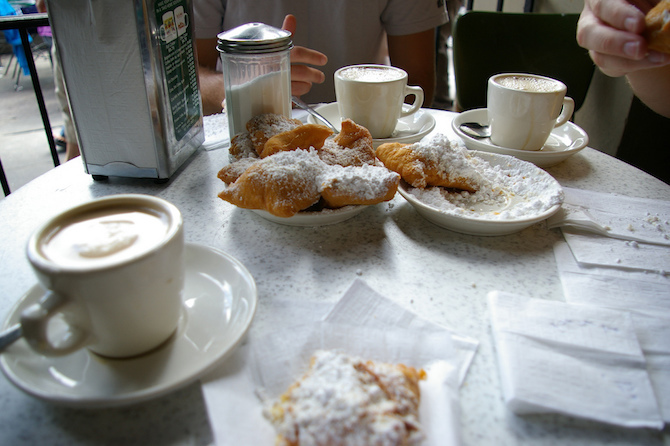 Morning Call and Cafe du Monde are old New Orleans traditions. The hats and coats worn by the waiters are part of the tradition. The businesses may be called Coffee Stands but they are actually very large buildings with indoor and outdoor eating areas. In true New Orleans style we were serenaded with some Jazz by two men outside Morning Call. The interiors have these beautifully lit signs saying the name of the coffee stand. One thing to know about beignets is that exhaling your breath on them causes the powdered sugar to go all around. That’s some of the fun of eating them other than their scrumptious flavor! From our beignet event we went over to a play area (which there are several of within the park) so the youngest two girls could play off some of that powdered sugar! While the girls were playing us adults got to enjoy seeing all the runners and walkers, many dressed in Christmas fun wear, participating in the Celebration in the Oaks Fun Run/Walk. It’s a 2 mile event with hundreds of participants. The park was even busier than usual with all the run/walkers but the event brought even more activities for the kids surrounding the end of the walk. I may have said there is hot chocolate everywhere but there was free hot chocolate at the end of the run/walk for everyone! There was more to our day in City Park and I’ll share that in the next blog. Time to wrap this one up for the day and get on with other things! Quartzsite, AZ is a sleepy town of about 3,000 residents during the hot summer months but when the temperatures cool down to the 70’s, hordes of RV’ers from the north and vendors following potential customers swell the number to around 500,000. The RV’ers stay in the various private campgrounds and more in the open desert managed by the BLM (Bureau of Land Management). Then it becomes the largest flea market in the U.S. and has the feel of a boom town. A big RV show is held annually and several gem and mineral shows can be found around town. When the temperatures climb back to the 80’s and higher in April and May, the northerners migrate back and the town goes back to sleep. If you have time to view only one video I’d watch the first one. What a wonderful week this has been! On Monday we went to Chip’s girlfriend’s birthday party at his house and Chip popped the big “Will you marry me?” question and she said Yes! Here’s the new little family, Chip, Misty, Kallie and Madisyn. And here’s the whole family that gathered for the party plus Misty’s boss Pam who was kind enough to take this photo for us. Tuesday through Friday we’ve been working around the RV. We’ve raked up dirt, planted rye grass and bermuda grass seed around the RV. Daily watering has the new grass sprouting like crazy. I’ve been busy this week with extra RVillage work and loving every minute of it. My favorite part of the job is when I make the phone call (at the previously booked time) to walk an RV park through the process of “claiming their park” which is how they can customize their RV Park’s space on RVillage. I get to teach them about all of the amazing resources that RVillage provides FOR FREE to their park. Seems like the word is getting out to more parks because every day there are parks requesting to claim their park. We have over 38,000 RVillage members now and it’s growing every day! Roy spent most of yesterday and this morning on pressure washing our rental house. The moisture from the pond and the dust created by people driving too fast down the dirt road created a brownish appearance to parts of our yellow and white house! You may remember when we were selling our house and everything in it one of the things we sold was our pressure washer. We’ve borrowed Elizabeth’s (the one we sold her!) and my brother in law George’s since then but Roy decided no more borrowing so we purchased one from Sam’s this week. What a difference pressure washing has already made to the looks of the house and he’s still working on it. Next he’ll pressure wash Dora, our RV, the patio outside the RV, and the storage building Roy built. All that remaining pressure washing will wait until next week because tomorrow, Saturday, we are joining Misty, Kallie, Madisyn and Haylee (Kallie’s cousin) at City Park to enjoy all the great park has to offer at Christmas including Celebration in the Oaks. What a wonderful day we have planned and I’ll be sharing when I can. It’s that wonderful time of year (said quite sarcastically) when I switch out our summer clothes for our winter clothes. While we have a nice size closet we choose to only keep one seasons clothing in the closet and the other is stored in plastic containers in the storage bins under the RV. This is what I’ve been working on the last two days and still working on it. All of the clothes coming out of storage need to be washed and while our wonderful little Splendide washer/dryer is perfect for most days wash, it works overtime when we switch out clothing for days on end!!! Our Christmas decorations are now set up on our dashboard with a few decorations outside. I took a second photo with the curtain open but all the decorations were too dark. Maybe a photo taken later in the day, we’ll see! Roy replaced the four sets of exterior house lights with LED lights. It’s sad that the original ones we purchased already needed to be replaced. The moral of this story is buy the best possible for longer life!